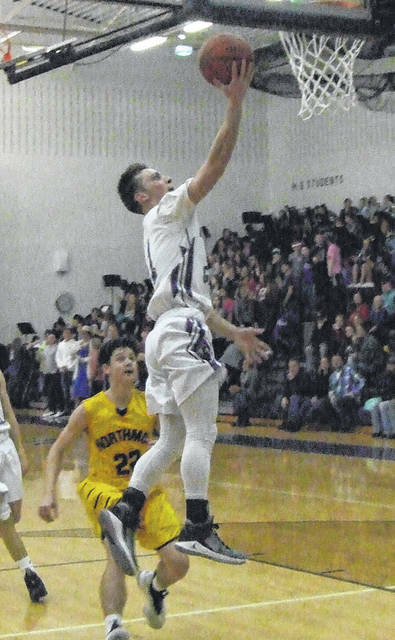 Northmor’s Blake Miller tries to put the ball in from short range in his team’s overtime win at Mount Gilead Friday. 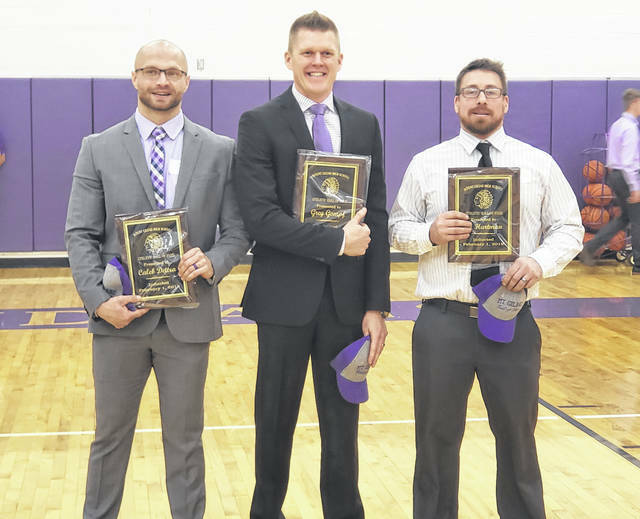 Before their game with Northmor Friday night, Mount Gilead inducted three new members into their Athletic Hall of Fame. Pictured are (l-r): Caleb Dettra (2005 graduate), Greg Gompf (2003) and Eli Hartman (2006). Adam Linder drives for two points in action from Friday. 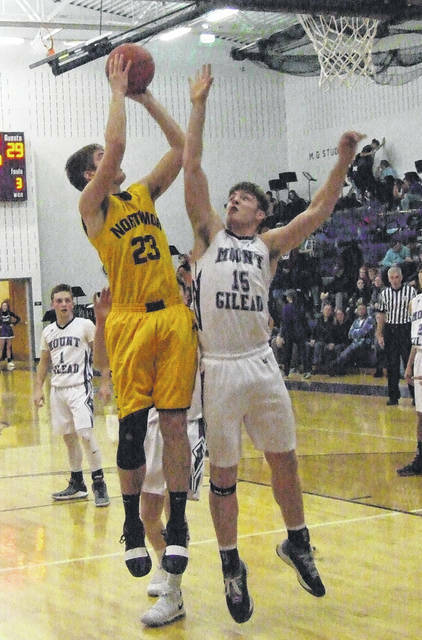 Northmor was able to outlast Mount Gilead in overtime Friday night by a 42-39 margin. In the defensive-minded game, the Golden Knights got a free throw from Kooper Keen with 47 seconds left in regulation to send the game to an extra period at 38-38. In overtime, both Cole Dille and Logan Randolph hit from the field and the Northmor defense was able to make those two buckets hold up as the team got a needed win. Northmor coach Zach Ruth noted that he’d been noticing some frustration from his team, saying that many of his players had experienced a lot of success coming up through the system, making it difficult at times to handle the frustrations of an up-and-down season. “United we stand and divided we fall and I had a sense there was a little dividing going on,” he said. However, against the Indians, Ruth was happy with what he saw, adding that the only thing he wasn’t pleased with on the night was his team’s 3-for-13 performance from the free throw line. After MG got off to a fast start, getting three points from Adam Linder and a basket from Mason Mollohan to take a 5-0 lead, Northmor got baskets from Blake Miller, Logan Randolph and Hunter Mariotti to take a one-point advantage. A three-pointer by Jackson Huffer helped the Indians take a 10-9 lead after the first quarter, but Northmor was able to battle back in the second quarter to take a 22-20 lead into the half. The teams continued to battle back-and-forth in the third. A three-pointer by Mollohan and a basket by Linder put MG back on top by a 25-22 margin, but Northmor immediately battled back with a three-pointer from Aaron Berg and a two-point shot from Mariotti to go back up by two. Ruth noted that his team got some key minutes from some players who hadn’t gotten a great amount of varsity time this year. However, neither team could get any separation. Baskets by Miller and Mariotti gave Northmor a 33-30 lead late in the third quarter, but a shot by Brandon Stevens beat the buzzer and made it a one-point game going into the final period. In the fourth, the teams would continue to trade the lead until Keen’s free throw sent the game to overtime, where the Golden Knights were able to pick up the win. MG coach Dan Strasser simply felt his team had too many empty possessions down the stretch. Strasser added that his team has been trying multiple kids in ball-handling roles, but have not been able to shake the turnover bug at key times. Mollohan scored 12 points to lead Mount Gilead, while Linder had nine. For Northmor, Mariotti had a game-high 15 and Miller finished with eight. Ruth now is hoping his team can close the regular season on a high note. “We tell the boys this is a chapter in their lives and if they open up the 2018-19 book, how is it going to end?” said the coach.